In this episode, Robert and I weigh in on Story Worldwide’s recent acquisition by Next Fifteen, and question whether Omnicom’s recommendation on shifting a big percentage of TV ad budgets to online video is a smart one. We also reflect on the meteoric growth of branded content at Huffington Post, and take issue with one PR practitioner’s rant about the death of traditional journalism. Our own rants cover the controversy surrounding an article on the role of journalists in brand journalism’s evolution, and a video from author Harlan Ellison on “getting paid.” Our #This Old Marketing example of the week explores a clever way space travel was marketed to the public. 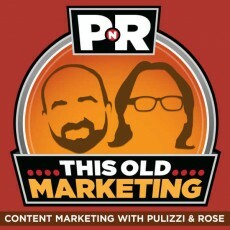 Download this week’s PNR This Old Marketing podcast. 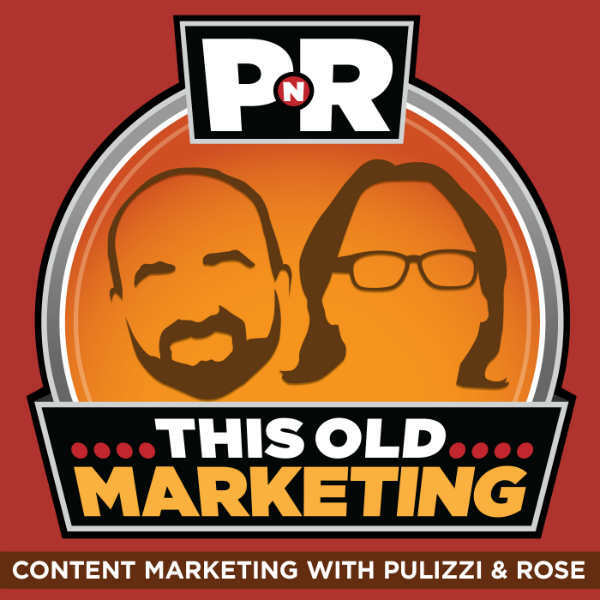 If you enjoy our PNR podcasts, we would love if you would rate it, or post a review, on iTunes. Next Fifteen Acquires Content Agency Story Worldwide (3:25): PR and marketing group Next Fifteen is accelerating its push into content marketing with its acquisition of Story Worldwide, according to PR News. I see this as part of an accelerating trend of ad agencies acquiring content marketing shops to round out their portfolios, and Robert predicts that few content marketing agencies will remain independent once this trend sweeps across the landscape. Omnicom Says Move 25% of Your TV Budget to Video (11:27): In response to changing media consumption habits, advertising giant Omnicom is recommending that its clients move 10% to 25% of their television ad budgets to online video. I’m not sure this move makes sense, since there isn’t enough creative to satisfy both online and offline channels, though Robert recommends looking beyond the surface of this announcement to uncover some exciting new integrated marketing opportunities. The Rise of Branded Content Puts HuffPo on Course for a 30% Revenue Stream (20:23):TheDrum.com reports that the Huffington Post will likely see 30% of its revenue coming from branded content solutions by the end of this year, according to CEO Jimmy Maymann. Robert and I concur that native advertising is becoming a “gateway drug” to content marketing; in other words, large agencies are using native advertising to experiment with the discipline. Once it’s successful, a tidal wave of VC funding will surely follow, Robert predicts. What PR Pros Know That Content Marketers Don’t (27:40):A syndicated blog post in PR Daily criticizes a PR rep who offered a newspaper reporter money to write favorable articles about her client. The post’s author, John Raffetto, called this a violation of PR ethics, perceiving it as a clear attempt to bribe the reporter. But a screen capture of the writer’s email reveals that this is nothing more than an effort to locate good writers for her client’s blog — an acceptable content marketing practice, in Robert’s and my opinion. Raffetto, a PR executive himself, is clearly confused about the nature of this inquiry. This week, This Old Marketing is being sponsored by Ektron, a global leader in digital experience management software. 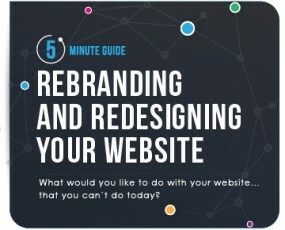 Ektron is promoting a new eBook, The 5-Minute Guide to Rebranding and Redesigning Your Website. Why does a company decide to rebrand or redesign its website, and who sets the priorities? Companies tend to redesign their websites because they’re not meeting expectations for customer engagement, lead generation and revenue. And, while IT used to set website priorities, now it’s marketing. This 5-Minute Guide explains more at http://bitly.com/pnr-rebrand. Robert’s Rant: Australian agency executive Tracey Fitzgerald has written a brilliant article on mUmBRELLA.com in which she suggests that journalists can play a positive role in the evolution of brand journalism. However, her opinion has created quite an uproar, with many people posting negative comments about her position on this issue. Robert doesn’t understand why, because even “pure” journalism is almost always influenced by some commercial bias. I agree: Even “impartial” newspaper reporters are getting paid by someone who usually influences story angles and what gets covered, to some degree. Joe’s Rant: This YouTube video shows a segment from an upcoming documentary about Hollywood writer Harlan Ellison. In it, the author goes off on a three-minute rant about a movie studio that wants to interview him for a documentary about his beloved sci-fi drama, Babylon 5, but doesn’t want to pay him for his time. He never works for free, but should content marketers insist on the same treatment? My opinion is it depends upon your business model, while Robert points out that nearly every industry and profession has been disrupted and we need to adapt to survive. 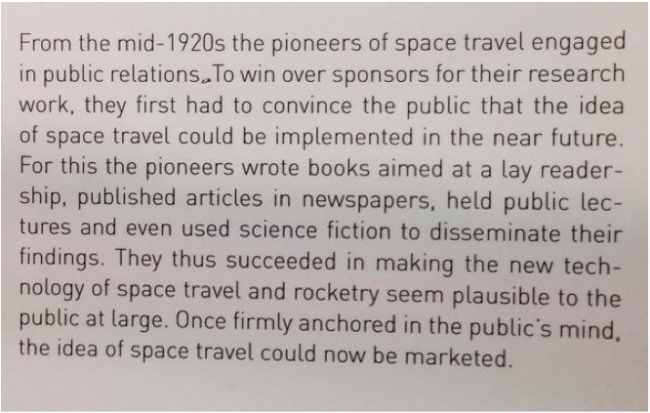 Space Pioneers: This Old Marketing fan Michael Weberberger recently sent us a picture from a display at the Vienna Museum of Technology that explains how space pioneers “marketed” the idea of space travel starting in the 1920s. 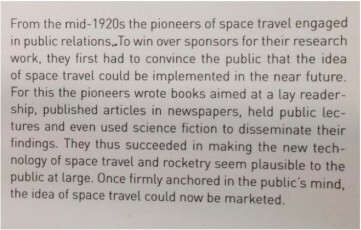 They appealed to the public with books, newspaper articles, public lectures and science fiction stories to make space travel and rocketry seem plausible in the near future. This change in belief made it possible to fund space research and development. It’s an excellent example of compelling storytelling aimed at influencers that drove a business result. For a more modern take on this topic, check out David Meerman Scott and Scott Jurek’s excellent book, Marketing the Moon: The Selling of the Apollo Lunar Program.